Click tabs for articles on each topic. Veterinarian offers tips to keep first-calf heifers productive in the herd. It can be a challenge to get first-calf heifers rebred without losing ground. All too often, they calve later the next year or come up open. The 2-year-old is nursing her first calf, still growing, and needs good nutrition and body condition to cycle on schedule after calving. Colin Palmer, associate professor of theriogenology at the Western College of Veterinary Medicine of the University of Saskatchewan, says people still recommend breeding heifers a few weeks ahead of the cows. “Heifers tend to have a longer postpartum recovery period than cows before they start cycling again. 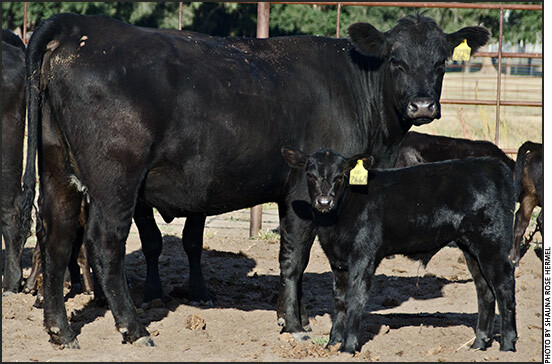 To overcome that, some ranchers have the heifers calving about one cycle length (three weeks) earlier than the cows. This gives them more chance to breed back again on time,” he says. Read more. “Every calf counts.” It’s a phrase most often heard around calving season. Certainly an important time, a calf’s first two weeks of life play a vital role in its future productive success. Ensuring each addition to the herd hits the dirt with ease, vigor and a strong will to live is essential. Additionally, providing the proper vaccination protocol to treat and prevent sickness and disease in susceptible areas is good management. Long before any of that can take place, however, the calf must be conceived, and proper care for bulls is a must. Breeding soundness exams are crucial when it comes time to turn bulls out with cows, and routine pasture checkups throughout the breeding season will help ensure bulls are working the entire season. The fact a bull worked last year is no guarantee he’ll work the next breeding season. Understanding that can save both time and resources. Read more. The real driver of beef demand is its unique flavor, and marbling drives flavor. This key component of quality grade has grown in the last few years to where the U.S. beef industry is probably producing the best eating experience in its history. That bodes well for beef demand. In 2015, the industry fed-beef average of 74.2% Choice and Prime carcasses was the highest ever achieved, and not by just a little bit. Last year’s number was 4.6 percentage points higher than 2014. The first eight years of this century saw a continued flat trend from decades past — 55% Choice and Prime. The next seven years have seen a nearly 20-percentage-point increase. Why did that happen? Price relationships and better cattle genetics are part of the answer, but here’s something you likely didn’t know. Read more. North Dakota Stockmen’s Association offers 10 tips to avoid blotched brands. Branding day is often an anticipated neighborhood event for North Dakota producers. As pastures green and turnout approaches, many producers enlist the help of neighbors and friends for branding day. North Dakota Stockmen’s Association (NDSA) brand officials are offering tips to accomplish the goal of producing crisp, clear images that leave no doubt concerning the ownership of your livestock. Stan Misek, NDSA chief brand inspector, said branding season is a critical time for producers to leave a lasting image that will serve as proof of ownership for the life of their animals. A poorly applied brand or a blotched brand does little good. Read more. The American Angus Association and its subsidiaries generate a wealth of information to keep members and affiliates informed of what's happening within the industry, as well as with the programs and services they offer. Click here for easy access to the newsrooms of the American Angus Association and Certified Angus Beef LLC and the Angus Journal Daily archive available in the API Virtual Library. Slow Internet speeds make data difficult to transfer in the field. While a great many who live in the city experience a speedy Internet, some of those living in more rural areas of the United States do not experience the same luxury. Slow Internet speeds in less populated regions can prove troublesome for those working in agricultural fields. With the abundance of technology in today’s society, it’s more important than ever for ag producers to use those resources that are available. Unfortunately, the lack of Internet connectivity sometimes hinders opportunities. Read more. New research shows that high-quality protein helps increase physical function during weight loss in older obese adults. New research published in the Journal of Gerontology: Medical Sciences shows that eating more protein from foods like lean beef as part of a reduced-calorie diet can help obese older adults with limited ability to exercise to lose weight and increase physical function.1 This new research, supported by the beef checkoff, contributes to the growing body of evidence that shows lean beef and other high-quality protein foods are beneficial for health, including for overweight and obese people looking to reduce weight. Read more.